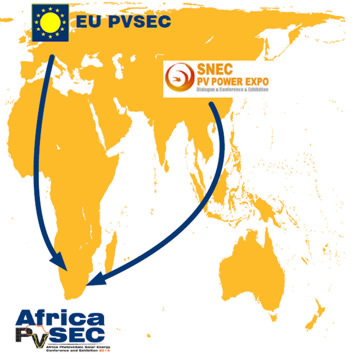 The EU PVSEC is supported by European and international organisations such as the European Commission, UNESCO – United Nations Educational, Scientific and Cultural Organisation, Natural Sciences Sector, WCRE – World Council for Renewable Energy, EPIA – the European Photovoltaic Industry Association, IPVEA – the International Photovoltaic Equipment Association. The Conference Programme is coordinated by the European Commission, DG Joint Research Centre. Approved by Ministry of Science and Technology of the People’s Republic of China [Ref. No. : (2012)0407], SNEC (2014) International Photovoltaic Power Generation Conference & Exhibition [SNEC PV POWER EXPO] will be held in Shanghai, China, on May 20 - 22, 2014. It was initiated by Chinese Renewable Energy Society (CRES), Chinese Renewable Energy Industries Association (CREIA), Shanghai Federation of Economic Organizations (SFEO), Shanghai Science & Technology Development and Exchange Center (SSTDEC), Shanghai New Energy Industry Association (SNEIA) and jointly organized by 16 international associations and organizations including Asian Photovoltaic Industry Association (APVIA). The exhibition scale of SNEC has evolved from 15,000 sqm in 2007 to over 230,000 sqm in 2013 when it attracted over 1,500 exhibiting companies from 92 countries and regions all over the world and the overseas exhibitor ratio is about 35%. SNEC has become the biggest international PV tradeshow with incomparable influence in China, in Asia and even in the world. SNEC 2014 Scientific Conference boasts of an extraordinary International Scientific Committee. The Conference is chaired by Prof Armin ABERLE, the CEO of the Solar Energy Research Institute of Singapore (SERIS). Prof Joachim LUTHER from SERIS and Prof Martin GREEN from the University of New South Wales will act as the honorary chairmen. Top PV scientists will be invited to present on the cutting-edge technologies of solar energy at the conference. We are looking forward to the worldwide PV industry friends gathering at Shanghai, China. From the industry's viewpoint, let us take pulse of the PV power market of China, Asia, and the world, so as to guide the innovative development of the PV industry! Hope all of us meet at Shanghai, on May 20 to 22, 2014!